It's 22:03 in Bear Valley Springs, USA right now. 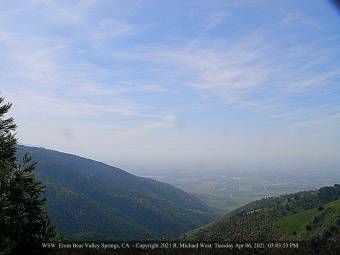 Tehachapi, California: Mountainbase Webcam, 10.3 miles away. Tehachapi, California: Tehachapi Airport, 10.3 miles away. Arvin, California: Arvin Union SD, 11.9 miles away. Alta Sierra, California: Alta Sierra Hikes, 39.7 miles away. Saugus, California: Valencia-Santa Clarita View, 51.8 miles away. Valencia, California: College of the Canyons, 53.3 miles away. Porter Ranch, California: Weathercam, 60.7 miles away. Canoga Park, California: Canoga Park High School, 66.2 miles away.